Your objective is to find 6 pages around the map, while exploring the map you will find some journals that will be helpful in later use but watch out! Slender and his minions will be watching and attack when you get to close! Are you up for the challenge? You don't know who you are, what happened, or where you are. Nothing is real, or is everything real? Imprisoned, yet not alone for within these walls They watch. These walls themselves move. Nothing makes sense. Can you escape imprisonment? Or better yet..... Will it let you? You only have one goal: escape. Run, hide, and craft the correct item in order to escape while avoiding the completely randomized monster! Can you make it out alive? The Predator, inspired from the movies, and his friend, the phantom hunt you down in a small forest map. The Waiting Room is a horror experience like no other. There are some puzzles, and even custom dialog! 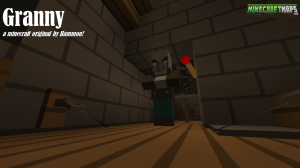 Murder in Noobville is a horror map about a murder. It's not too scary and has a funny twist to it. Granny keeps you locked in her house. And you have to try to get out.